Klarna. Buy Now, Pay Later. thinking about using klarna? see below for full deets! You can either pay by Pay Later or Slice it. Once your order's confirmed, you'll receive an email with payment instructions within two days from Klarna. You'll then have 30 days to try on your order and only pay when you’re happy. Complete the payment online, at your convenience, with no extra cost. You can pay via credit or debit card at www.klarna.com/uk. Klarna may run so-called unrecorded enquiries (or soft credit searches) that do not affect credit scoring and are only visible to you and Klarna, but not visible to other lenders. Neither Klarna nor SIMMI run credit searches against you that could impact your credit rating. As soon as SIMMI have accepted your cancellation/return, then Klarna will cancel the statement or refund your payment. Payment information is processed securely by Klarna. No card details are transferred to or held by SIMMI. All transactions take place via connections secured with the latest industry standard security protocols. If you pay by card, SIMMI will confirm your order right away. If paying by Pay later, Klarna will send you a payment confirmation to the email address that you have used for your order. If you have made a payment but not received the payment confirmation, you can always check the status of your order and payments by logging in at www.klarna.com. Once SIMMI has received the return (partial or full) and you have received their confirmation of this, an updated statement will be sent to you by Klarna if you've made a partial return. With a full return, your statement will be closed. You have 30 days to pay, so you don’t need to pay right away. If your due date is near and there is no sign of your goods, please email SIMMI to check on delivery. You can also contact Klarna’s Customer Service so that we can postpone the due date on your payment. Spread the cost of your purchase into three equal monthly payments. 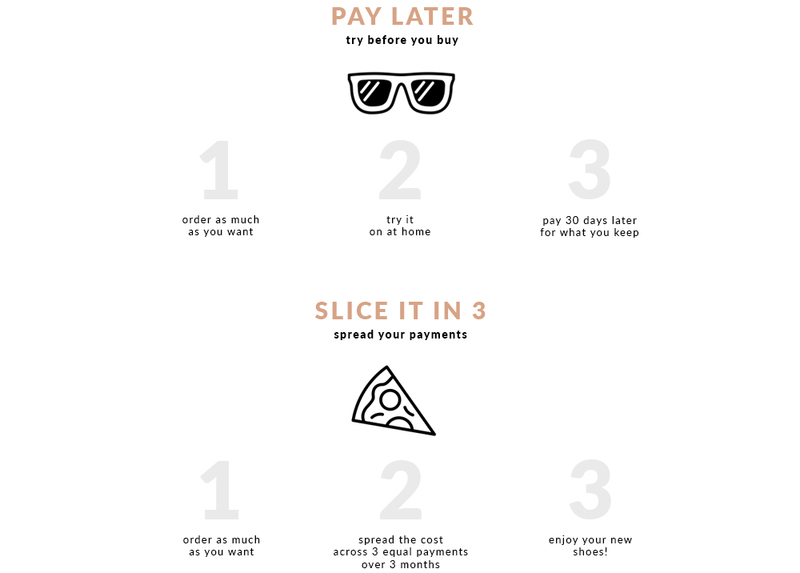 Slice it is a promotional plan on the Klarna Account. As soon as SIMMI have accepted your cancellation/return, then Klarna will make any necessary adjustments your balance and provide further help if needed.